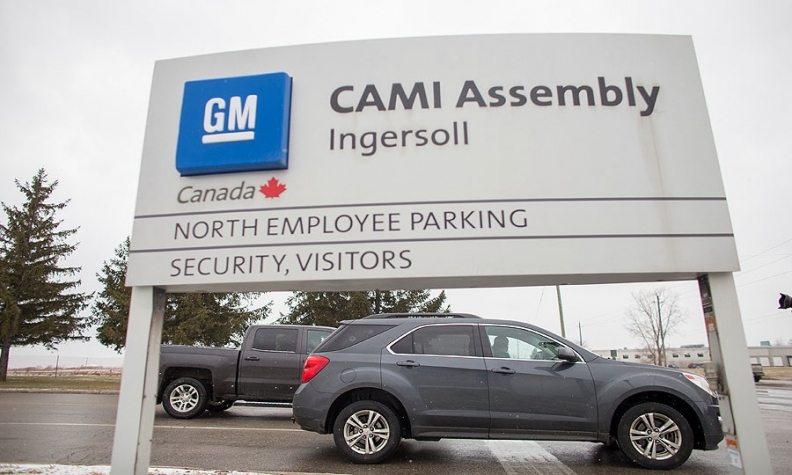 Workers at General Motors’ Ingersoll, Ont., assembly plant voted Sunday to authorize a strike should no labour agreement be reached next month. Unifor Local 88, which represents the CAMI Assembly workers, said 99.8 per cent of workers at the plant voted for strike authorization. The vote, largely a formality, gives Unifor leadership the authority to call a strike if the union and GM fail to reach an agreement on a new labour contract at the plant by the Sept. 17 deadline. The labour negotiations, which began last month, come as GM was set to lay off about 400 workers at the plant this month as it shifts GMC Terrain production to Mexico. About 200 workers took early retirement packages earlier this year. Speaking with Automotive News Canada earlier this month, Unifor President Jerry Dias said the union’s top priority in negotiations with GM is to secure jobs for the laid off workers and to “maximize output” at the plant, which will build only the Chevrolet Equinox after Terrain production ends. About 2,450 hourly workers will be employed at the plant following the layoffs, as well as about 300 salaried workers. CAMI Automotive was founded in 1986 and was originally a joint venture between GM and Suzuki. Production started in 1989. Some of the first vehicles assembled at the plant included the Geo Tracker and Geo Metro for Chevrolet and the Suzuki Sidekick and Swift. CAMI Automotive became a fully owned entity of General Motors in 2011 and is now known as CAMI Assembly.